Hi! I am Kori Clark from Paper and Pigtails, where I blog when I am not working on digital illustrations and graphic designs! I am sharing a teacher appreciation gift card printable I created today, and I am so thrilled, as teachers are so close to my heart! My mom was a teacher for over 30 years. I remember many afternoons and nights of her grading papers, working on lesson plans, making games and activities for “her kids”, and staying late at the school to organize and decorate her class to encourage little minds! I never thought much of it growing up, it was just her job. As I got older and then became a mom myself I realized how amazing her career really was, and how she was driven by a passion for helping children. She, like most teachers are not driven by success, or money, or power and fame…she was driven by the little 5 year old who made pancakes for herself before school on her birthday, because no one else was awake. She was driven by the kids who needed someone to believe in them so they could come out of their shell. She spent her own money and resources many times to help her class. In fact, she loved teaching and being with the kids so much, that even after she retired, she couldn’t leave. Now she is a substitute and works 2-3 days a week at least. My daughter started kindergarten this past year and I hoped for someone with as much love and passion for teaching as my mom has…then I met the kindergarten teachers at my daughter’s school and they all do! I am so grateful that there are such beautiful people in this world to guide, teach, and love our children when they aren’t with us. I know my mom has gotten an assortment of “thank you’s” over the years, so I asked what she thought she (and other teachers) would prefer the most as a thank you. 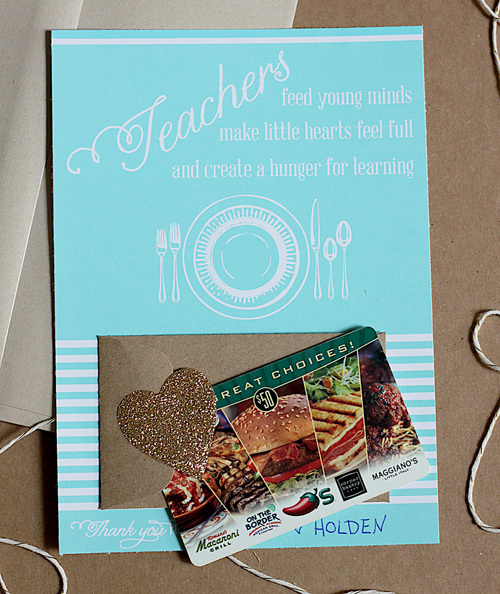 She replied “Little gift cards are always nice…it doesn’t need to be much…but they are always useful… or food… food is always great.” I decide for teacher appreciation week this year, I would combine her suggestions and create a teacher appreciation gift card printable, for food themed gift cards! You can find ones for a grocery store or a local restaurant, or you can buy the ones that can be used at a variety of restaurants! There are a lot of options to suit the teacher in your life! 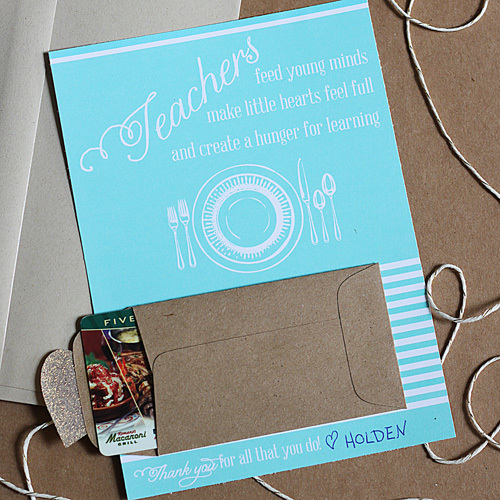 The printable I created to attach the gift card too says “Teachers – feed young minds, make little hearts feel full, and create a hunger for learning”. You can attach the card directly to the striped area using double sided tape, or you can get a little creative like I did in the photos! I found a little envelope to attach to the Teacher Appreciation card and slide the gift card into, then sealed it with a gold glittery heart. I used bakers twine to wrap around it so it feels like opening a gift! To download your printable card, CLICK HERE! 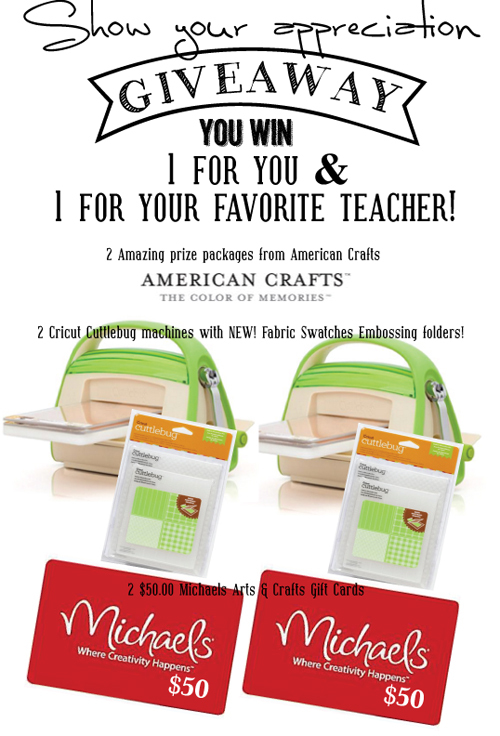 Stop by Paper and Pigtails for more crafty inspiration and to enter the Show your Appreciation giveaway today (you get a new entry each time your visit our guest blogger)! We are giving away hundreds of dollars worth of fun goodies! You won’t want to miss this! 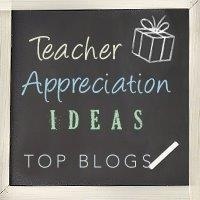 Your teacher appreciation card is so cute and I would love to use it! However, I wish you wouldn't work through a third party for me to be able to download it. To have to use them compromises the security of my information on my computer so I don't use them. :( If there is an alternate way to download, I would love to know! How do I order the card above? The one for the teacher where you put a rest gift card in it? Teri, it worked for me. It opens to a new window for printing. Love this card! Thank you for sharing!! I can't download the file :( Can you see if it works for others? Can the whole card with envelopes, twine, glitter heart be purchased at Paper and pigtails etsy store? Do you know what size the individual printable card is? wonderful idea and love the printable. And thank you for sharing it!!!! I've been checking out teacher gifts for a few months now and this is by far my favorite! So classy. Will definitely be using this one! 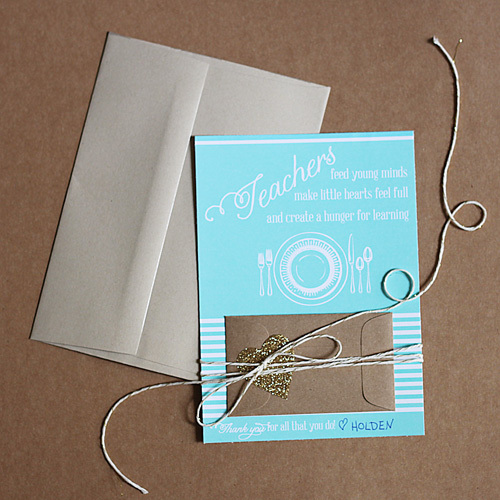 This is adorable, I love cute and easy teacher gifts to give!! SO CLEVER AND SO CUTE!!! This is a sweet idea! Love it! Printing it out now. Thanks so very much. A very cute idea! Thanks!